Mt. Umunhum Trail under construction. Photo courtesy Midpeninsula Regional Open Space District. View of the radar tower from the Mt. Umunhum trail. Photo courtesy Midpeninsula Regional Open Space District. The Ohlone named it for hummingbirds, the Air Force built a radar station on its peak, and now MidPen is turning Mt. Umunhum into a park. Nov. 10, 2015—While growing up in the South Bay, I heard rumors about the mysterious building looming over the valley. When I was eight, a friend told me that the giant box atop Mt. Umunhum was the site of an adults-only, glow-in-the-dark bowling alley. At the time, it seemed like a plausible explanation for the building’s presence. When I was 13, snow fell on Mt. Umunhum. Snow is not a regular sight in San Jose, home of the skin-melting heat wave. My family and I drove up the mountain to check out the snowy peak. Park rangers blocked the summit access road, asserting that it was closed to the public. They explained that the abandoned radar tower was unsafe for public exposure. More importantly, they told me that there was no glow-in-the-dark bowling alley. I was devastated. In fact, the summit of Mt. Umunhum was fenced off more than 35 years ago. The abandoned radar tower is what remains of the Almaden Air Force Station. It protected the Bay Area from attack during the Cold War, and is a characteristic feature of the mountain range. But unless $1.2 million is raised in the next two years, the historic structure will be demolished. Umunhum (pronounced um-un-um) is the Ohlone word for “resting place of the hummingbird." Although Ohlone people never lived on the peak, they would climb to the summit to pray. This is no simple feat. Mt. Umunhum stands at over 3,000 feet in elevation and is the fourth-tallest peak in the Santa Cruz Mountains. In 1958, during the height of the Cold War, the US military began construction of the Air Force Station atop Mt. Umunhum. The tower and a small military town was completed in 1961. At one point, there were over 200 people living on the mountain. The Almaden Air Force base served as a lookout point for a Soviet attack. 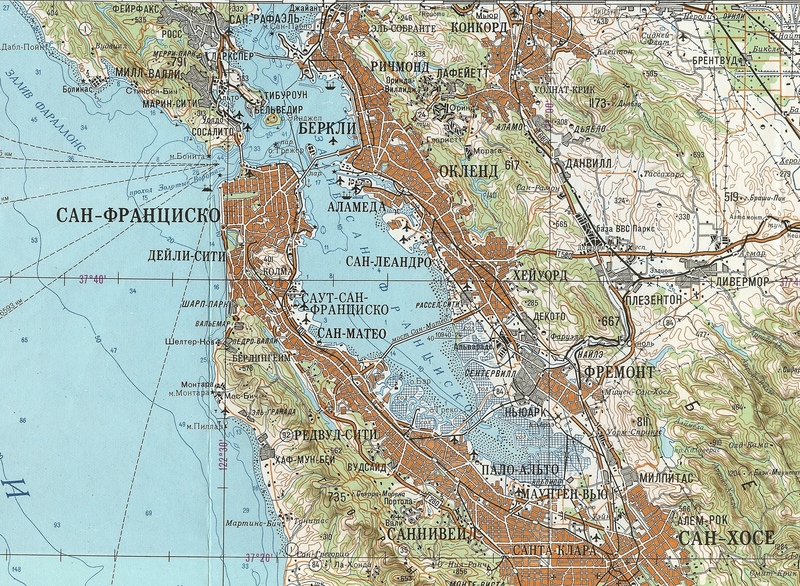 The west coast was a target for Soviet military operations. Here is a Soviet map of the San Francisco Bay Area used for planning attacks on California’s most densely populated urban hub. Before it was shut down, the radar tower was adorned with a massive red and white radar sail. The 125 ft. by 50 ft. sail weighed over 85 tons, and spun at a rate of five revolutions per minute. The radar sail was dismantled when the tower closed in 1980. Six years later, the government sold the abandoned site to the Midpeninsula Regional Open Space District (or “Midpen”), an organization dedicated to protecting and maintaining expansive spaces of wildlife and trails. Now, Midpen is planning on developing a system of trails on Mt. Umunhum. To ensure public safety, they will have to either demolish or repair the building. The tower has deteriorated over the past 35 years, so unless one is experienced at dodging falling pieces of a crumbling building, it is unsafe to be around. But Midpen does not have sufficient funds to renovate the radar tower. Jaber and Drake started the Umunhum Conservancy when Midpen announced plans to demolish the radar tower. Jaber says their non-profit organization formed in a parking lot, immediately after a community meeting regarding the demolition of the tower. Without a doubt, Jaber is the ultimate historian of the site. He delivers monthly presentations at the Quicksilver Mining Museum in Almaden Valley. His presentations are filled with a variety of dynamic photos of the site – some he has taken, and various historical photographs donated by veterans of the Air Force base. Jaber says that the photos were not easy to collect. “If you took pictures inside a radar station during the Cold War, you could get tried for treason,” he explains. Jaber’s photo collection paints a colorful image of the lively mountain town. He has pictures of the town market, Air Force bar, gymnasium, and swimming pool. He even has a picture of the Air Force’s private bowling alley (unfortunately, it was not of the glow-in-the-dark variety). The tower was a comforting beacon of security for South Bay residents during the Cold War, Jaber says. When the sail would stop spinning to undergo maintenance, townspeople would call to make sure everything was okay. By the late 1970’s, Mt. Umunhum’s military outpost was turning into a ghost town. Satellites were blasted into space and replaced radar stations on the ground. Only a handful of soldiers and their families remained on Mt. Umunhum. Finally, on March 29, 1980, the Almaden Air Force base shut down. When Midpen purchased the land in 1986, it only cost them $260,000 – a steal for such prime real estate. Mt Umunhum remained untouched until 2011, when Midpen began trail construction. The first step for opening the summit was clearing out the old air force buildings. With funding from the government, Midpen removed poisonous asbestos, lead paint, and diesel fuels from the summit. The organization also demolished most of the Air Force buildings. But in response to local animosity towards the tower’s impending demolition, Midpen decided to give the community a chance to save the historical structure. Manning leads the Mt. Umunhum Summit Project. Currently, it is one of Midpen’s biggest and most anticipated ventures. Midpen plans to eventually connect Mt. Umunhum to nearby Open Space parks. The project started in 2011, and the summit’s first trail is expected to open to the public in October 2016. This trail will extend for five miles around the mountain, and will lead to a breath-taking vista point looking over the valley. “That is record time for a public agency to get something of this magnitude completed and opened,” Manning says. Midpen is allowing the Umunhum Conservancy until October 2017 to raise funds for tower renovations. The nonprofit group aims to raise $1.5 million from the local community. If the Umunhum Conservancy does not reach its goal, Midpen has alternative plans for the tower site. One option is to demolish the tower entirely and return the summit to its natural state. This plan lines up with Midpen’s “open space” mission, and would be the cheapest option. Another option is to retain a portion of the bottom floor, and transform it into an “open-air” memorial structure. The open-air structure would include historical information about the old radar tower. Drake and Jaber are avid proponents of preserving the tower, and opening the first floor as a historical museum. Midpen is ambiguous about their position regarding the construction of a museum. But for members of the community that have grown attached to the tower, Mt. Umunhum is about more than just the mountain. So far, the nonprofit has raised only 20 percent of the necessary funds. But the Umunhum Conservancy is not fazed by the tremendous task at hand. Jaber suggests that corporate funding will be the golden ticket to preserving the tower. He is confident that the community will rise up to save the tower before they run out of time. Looking back at the mountain’s history, it is clear that it will always be a site of interest. For some reason, Mt. Umunhum is extremely alluring to people – whether it’s for the purpose of a praying site, an air force base, or a network of trails. Who knows – maybe one day someone will finally get around to building a glow-in-the-dark bowling alley up there. For more information on how you can help preserve the radar tower, click here to visit the Umunhum Conservancy web page. For updates on the status of Midpen's upcoming summit trail and other Mt. Umunhum trail plans, click here to visit the Mt. Umunhum Summit Project web page.